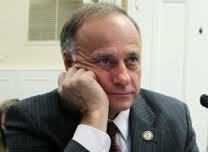 Congressman Steve King has a long and consistent record of voting for issues that are not in the best interests of Iowans. During his 10 years in Congress, he has repeatedly voted against legislation that would promote job growth and economic prosperity here in Iowa, make college more affordable for students, and ensure Iowa’s seniors can get the health care and services they need. He claims that he would like to focus on the issues, but a closer look at his voting record indicates that he’s not interested in solving those issues. Instead, his votes make the issues worse. – Supporting the Ryan Budget for two years in a row. When questioned at town halls across the state, he has falsely said that it doesn’t cut Medicare or Pell Grants, both of which it does cut, and drastically so. – Steadfastly supporting the Fair Tax, a plan that would burden the middle class and seniors, while giving more tax breaks to the wealthiest Americans. –Masquerading as a supporter of wind energy, a vital industry in Iowa. But he has spent years voting against it. He even opposed a bill that the American Wind Energy Association praised as “essential” to growing the industry. –Claiming to be a fiscal conservative, but voting for two unfunded wars, an unfunded Medicare Part D, and unfunded tax cuts for the wealthiest Americans – all of which have directly contributed to our nation’s debt and deficit crisis. And the list goes on. Congressman King’s 10-year record should leave a lot of questions in the minds of voters. How can he represent a district with a large senior population while voting to end Medicare as we know it? How can he expect students graduating high school this month to afford an education when he’s taking away Pell Grants? How can he be trusted to support wind and renewable fuels, important growing industries in his district? Will he finally put his constituents ahead of special interests? Why is he more interested in building a national profile than proposing solutions for his district? If he wants to talk about the issues, he should start by addressing his hypocrisy and inconsistency during his ten years in Congress, years which have had wasteful spending, partisan extremism, and gridlock as their hallmarks. As he introduces himself to a district that’s over 50 percent new to him, voters will demand answers to these questions and take a hard look at how his positions on the issues benefit them. The truth is, unless they’re a special interest, his policies don’t help them and they don’t create opportunities for middle class families, seniors, and students. This entry was posted in 2012 Election Campaign and tagged Iowa's 4th District, Ryan Budget, Steve King, Violence Against Women Act. Bookmark the permalink.